Sample them at the local wine-tasting centre, which is a part of the famous Porto Carras tourist resort. Porto Carras complex has three hotels and it also includes a marina with pleasure craft, an open-air theatre, a casino and a golf-course. Porto Carras also includes a model farm and poultry farm to supply its needs, an oil press and a winery, which produces its tasteful range of wines. 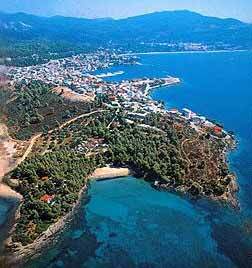 Since 1970 the great increase of the tourist traffic, turned Neos Marmaras into the tourist centre of the area.